First, this is an HD resolution test. Be sure to use a display with a native resolution of 1920x1080p/60 and turn off all optional signal processing features that will obscure the test results of the signage player [i.e. use 1:1 pixel mapping, turn off scaling, image enhancement, noise reduction]. Second, take a look at the digital signage hardware specifications. This is the first category for consideration on the scorecard. Is it commercial grade rated to perform reliably for years of 24/7 operation? Is it a consumer system rated for 16/7 operation? 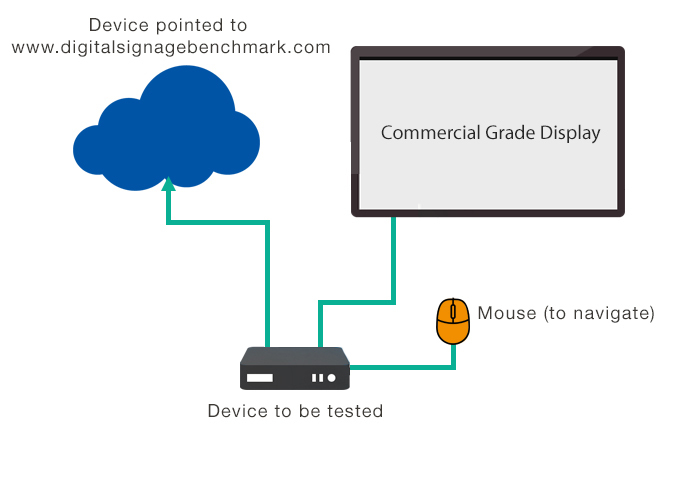 The Digital Signage Benchmark is a publicly available resource, offered at no cost, for use by any interested party. Reviewers must agree that any submitted results are TO BE CONSIDERED PUBLIC DOMAIN at the time of submission. Reviewers and their results will be validated for accuracy and will be posted anonymously.